I decided to write this post, because I keep winning things lately in competitions, and my friends are asking, ‘How do you do it?’… Well, I’m sorry to tell you, but there’s no real secret, just a little determination, belief and a lucky streak that’s been with me for much of my life! I’ve often won things in the past… several years ago I won £50, an iPod, tickets to see The Blizzards in Dublin and tickets to the Oxegen festival in Ireland. Not to mention several hundred Euro worth of pre-paid Mastercards in one competition! For a while then, I didn’t win much… but perhaps that’s because I wasn’t entering anything – and that’s TIP 1 – you can’t win, if you don’t enter!! It sounds simple, but most of the people who say to me, ‘Oh you’re always winning stuff’, with a sound of surprise and dissapointment that they don’t, don’t actually enter any competitions! Which leads me onto TIP 2 – where to find competitions – there any many places to look for competitions. Many of the things I’ve won in the past have been from products/companies I already use. For example, enter the codes on your ice cream – I kept winning, in every box! I know that may be a bit rare, but it paid off for me!! I also follow the Facebook and Twitter pages of brands I like – they often do giveaways, and all you have to do is like and share, or follow and retweet! Just in the last few days, I won ‘The Curious Incident of The Dog in the Night Time’ book and £20 of Wagamama Vouchers – just for answering a question on the Facebook page – can’t wait for that one to drop through the door! I also find competitions on the MoneySavingExpert website – everyone knows how to find that one and the forums list lost of competitions! It takes a bit of time, but it’s worth while and always pays off eventually… TIP 3 – if you enter loads of competitions, you must win something! My final, and most important tip of all is TIP 4 – Always believe that you can win! – everyone will tell you that you can’t, or that the odds are too low, but you just never know! And if you say you can’t, and then don’t enter, guess what… you won’t! And to keep you inspired, here’s a list of what I’ve won this year so far…. – A box of Ombar Raw Chocolate bars – these are amazing and to die for… with no refined sugars and probiotics, they are worth their weight in gold! Won from Planet Organic Click here for their site! – Tickets to see Blind Date on Stage at the Charing Cross Theatre in London – a wonderful night, truly unique, where no man from the audience is safe! Go see it if you have chance! – A Vita Coco beach set – this was truly fab! 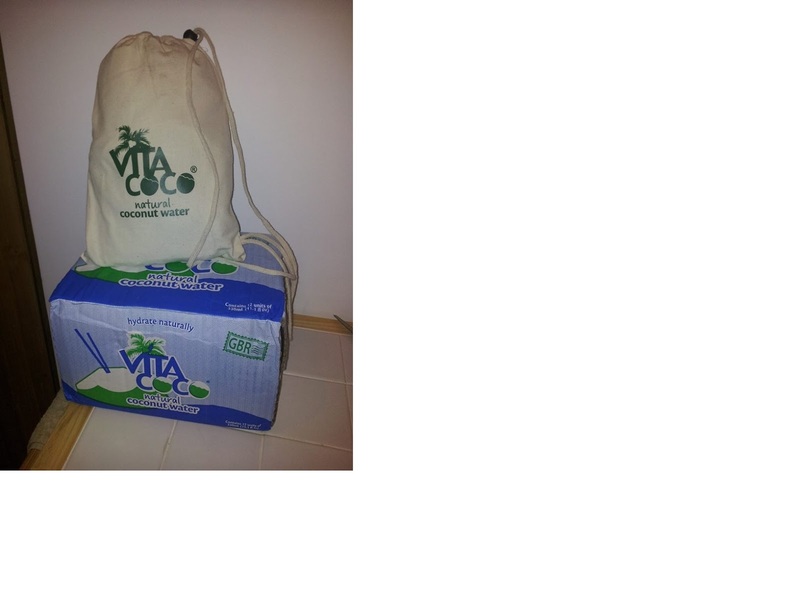 I received one package from them with a small carton of coconut water, a lovely cotton bag and a beach ball! I was happy as can be with my little prize, when out of the blue, a week later, a box of 24 cartons showed up, with a hammock too! A hammock – what a fantastic prize!! Won by retweeting on the Twitter page! – The book, The Curious Incident of a dog in the Night Time (a wonderful book by the way) and £20 of Wagamama Vouchers – won from the Facebook page! To be honest, there may be something I’ve missed… and I’ll try to keep it more up to date in future! But what wonderful prizes! Previous Post Is it just me… ? Next Post Great People, Great Animals!